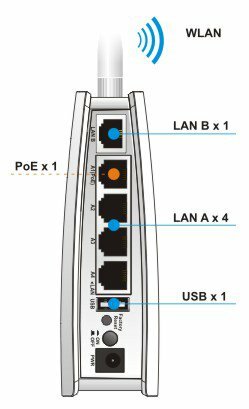 Power over Ethernet (PoE) support eases the installation by running only one cable to VigorAP 800 to deliver both data and power. You can mount VigorAP 800 to the place which is best for extending coverage without considering if there is ready access to a power plug. Of course, you can also use the included AC adapter if power is available nearby. 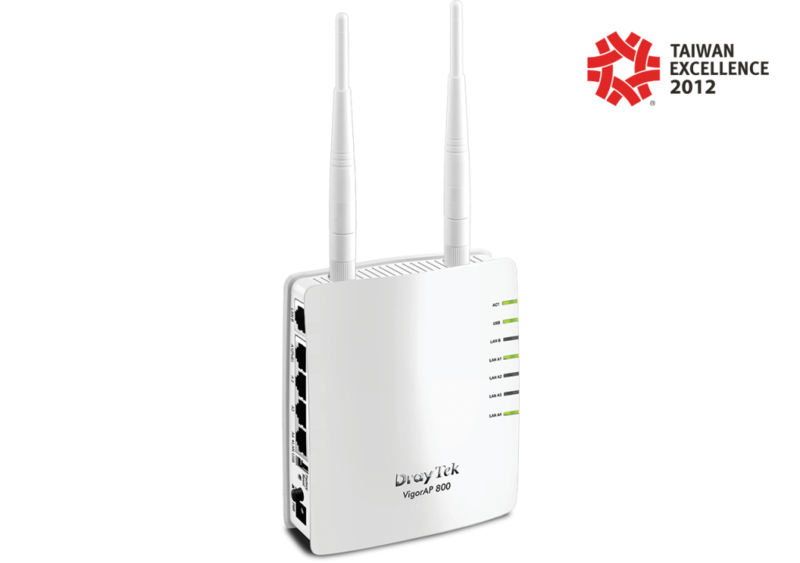 The VigorAP 800 supports 4 separate SSIDs and two virtual LANs (VLANs). You can set certain SSID(s) accessing Internet through either VLAN A or B (LAN_A or LAN_B in WUI). As a result, the VigorAP 800 divides itself into several virtual access points all within a single hardware platform. Many mobile networks deployed at corporate offices, hotels, shopping malls or restaurants can take advantage of this technology to support several applications such as public Internet access and inventory management. For example, guests of a company could be given wireless access for the Internet, but they are excluded from any access to the internal data server. You can obtain the MAC addresses of each wireless client from its configuration utility or operating system. You then enter these addresses into a configuration page of VigorAP 800. 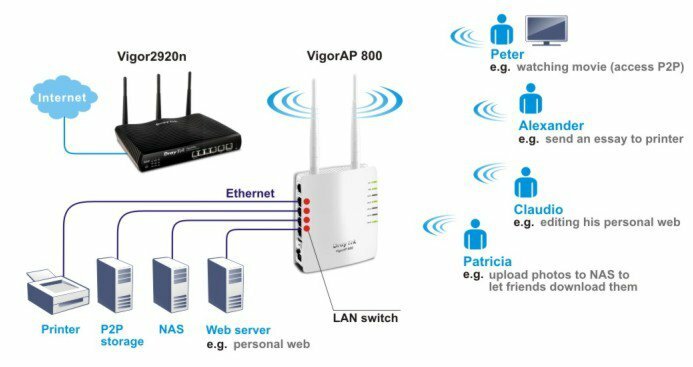 When MAC address filtering is activated, VigorAP 800 performs additional check for wireless clients to prevent network breaking. Clients within the authenticated list will be able to join with the WLAN. Those who are not on the list will be denied while VigorAP 800 receives their request to join the WLAN. 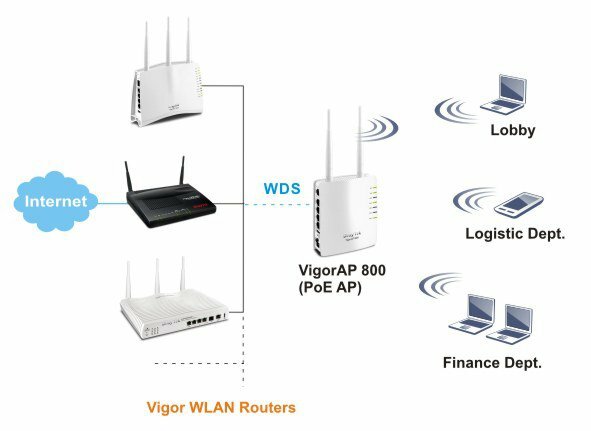 The VigorAP 800 can extend over large areas (alike shopping mall) by its “WDS” (wireless distribution system). WDS takes care of the establishment of WLAN network with “point-to-point” and “point-to-multipoint” bridging and repeater modes. The repeater mode provides extend wireless access to additional clients where there is a relay AP repeats signal from a base AP to distant clients. The bridge-to-bridge mode allows two wired networks to be connected across some distance. The detachable antenna will let you replace with DrayTek antennas for directional signal shaping or mounting flexibility.